Recently, Google News announced a suite of product changes aimed at helping paid subscription-based news sites. In this post, we’ll be looking at different facets of this announcement and their implications for Google News' growth. 1. If you're an aggregator, start with distribution and then leverage the power it affords to build a platform that can own additional parts of the funnel. Google "took over the world" by building an incredible distribution engine for publishers and an effective discovery engine for consumers. It's continuing to drive growth by transforming that distribution engine into a platform that will allow it to own acquisition, engagement, conversion and monetization for publishers, in addition to discovery. 2. If you're a content producer reliant on one key distribution channel, design your content specifically to fit the channel (and how it makes money), and look for opportunities to create new content formats as your main distribution channel evolves. Upstart video content creators producing new genres of content such as Let's Play videos and Product Unboxings, were able to build large audiences on the back of YouTube. As Google News evolves into a platform that controls the full funnel, publishers who design their content for the new world of Google News should do very well. Traditionally, Google News has been unfriendly towards the interests of subscription-based publishers - their “first click free” policy required that clicks from Google bypass news paywalls for at least the first three articles per day in order for those articles to rank prominently. End users widely abused this loophole, which weakened publisher’s attempts to control their paywall. The Wall Street Journal reported that conversion rates for subscriptions increased 500% after opting out of first click free earlier this year, though the site’s Google traffic dropped by 44%. The end of “first click free” seems to represent Google’s first steps into supporting payment-based business models for publishers. But, the announcement of three additional features, set to roll out in 2018, could have deeper consequences for publishers, both subscription and ad supported. 1. Google plans to use machine learning to identify new audiences of users most likely to subscribe in exchange for publishers sharing their audience profile information with the search company so that Google can create “lookalike” audiences to increase acquisition. 2. Google will display articles from a user’s subscribed publications more prominently in search results in exchange for publishers sharing their subscriber lists with Google. 3. Google will support one-click subscription to publisher’s websites using credit card information saved with Google, in exchange for Google retaining primary ownership over the customer relationship. On the face of it, all three of these product announcements make sense because they directly address publisher weaknesses in discovery, retention and conversion/monetization respectively. And, while Google claims that each of these features is opt-in and “mix and match,” realistically, most publishers will have little choice but to hand over user data in exchange for access to Google’s traffic engine. But by doing so, publishers are handing over power to Google to act as aggregator and platform provider. What are the longer term growth implications of this shift? Let’s take a look at Google’s other major content platform, YouTube, for some relevant lessons on what aggregation can do both for publishers (content supply) and for the marketplace as a whole. The power of YouTube as a platform comes from its ability to let content creators just focus on the act of creating. 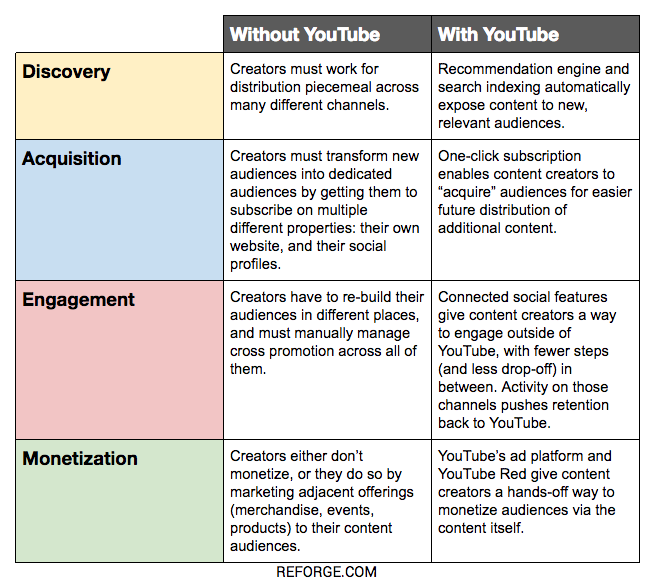 Prior to YouTube, content creators had to figure out how to best promote their work (discovery), how to establish a relationship with their audience (audience acquisition), and how to monetize that attention in order to sustainably fund new work. When YouTube came along, taking all of those additional steps still helped creators in growing their audience and business, but they were no longer mandatory. YouTube’s recommendation engine, paired with ranking in Google search, helped expose a creator’s work to new, relevant audiences. YouTube’s ad platform (and later, YouTube Red) allowed for transparent monetization (although a lack of direct creator payments has allowed Patreon to fill in a crucial platform gap). By enabling (and owning) automatic discovery and monetization, YouTube has become the dominant video content platform today. This automatic discovery-acquisition-engagement-monetization combo is what Google News will soon do for publishers. All of this power comes with a cost. While creators are free to focus on the creation of “good” content, “good” in this context is defined by Google’s algorithms. By playing on someone else’s turf, content creators remain at the mercy of changes to the algorithm like the recent “adpocalypse” that imposed stricter standards on which channels could monetize and limited monetization for sensitive channels. And, while individual creators have gained audiences and opportunities they never would have seen before, it’s also undeniable that power has flowed to Google, who controls the platform. Case in point -- while existing legacy video brands like ESPN or the Food Network have leveraged YouTube to grow their audiences, the real winners of the platformization of video are small creators who would otherwise have never been able to get in front of, and acquire, substantial audiences without YouTube. The rise of genres such as Let’s Play videos or Product Unboxings have been built on the backs of “no name” creators on topics that would have never gotten exposure - let alone dedicated, subscribed audiences - in a pre-YouTube universe. The news ecosystem is one that differs significantly from video. Likewise, crucial elements of Google's news content strategy differ from its approach to crowd-generated video content. Most notably, Google is entering news from the direct payment subscription side while it doesn’t even offer such a product on YouTube, leaving that business to Patreon (so far). But, Google’s attempt to insert itself into the discovery/retention/monetization cycle pushes a platformization model that gives them strategic options for future growth. Some have speculated that this is Google laying the groundwork for a “Netflix/Spotify for news” style system, switching news from a pay-per-channel model into more of an all-you-can-eat. Today’s existing publishers will have little say in the matter as they start from a relatively weak negotiating position. On the one hand, there’s room to be tentatively optimistic that Google’s changes will result in more news consumed overall, much in the same way that YouTube has exponentially increased the amount of video people watch. But, if Google’s move proves successful, the real winners will be brand new publishers who are able to customize their product to fit the new channel and model that Google will roll out in 2018. We can expect Google’s reshaping of discovery, acquisition, engagement, and monetization to create brand new formats of news content - in the same way that YouTube showed the world that watching people play video games or eating ramen could be a big business.